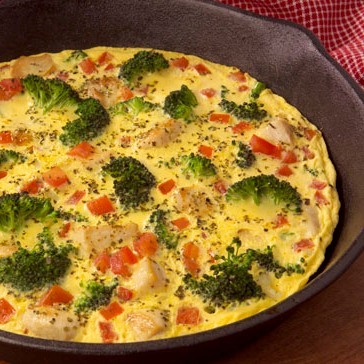 Chicken and Veggie Frittata – Recipe makes TWO servings! Start your day out right with a big serving of protein and even bigger taste! This Ideal Protein recipe is great for all phases and will give you a boost to your morning. It makes two servings so it is good for your plus one. 1. In a skillet, saute the broccoli, mushrooms, and scallions in olive oil until tender. 2. Add chicken; heat through. Remove from the heat and keep warm. 3. In a mixing bowl, beat eggs, water, mustard, Italian seasoning, and garlic salt until foamy. Stir in cheese (PHASE 4 ONLY), tomatoes, and broccoli mixture. 4. Pour into a greased shallow 1 1/2 quart baking dish. Bake at 375 degrees F for 22-27 minutes, or until a knife inserted in the center comes out clean.